Manandeep holed the back of the net in the 78th minute to hand the Mariners their first-ever point from the capital city of Mizoram. Five minutes prior to that, Khawlrhing breached the Mariners’ defence to notch the Reds’ first goal of the match. His right-footed blasting shot ricocheted off the crossbar to land inside the goalline while Ricky and Shilton goofed up to clear the ball off the goalline. The game saw everything: red card, penalty, penalty shouts, glorious saves. Ivorian forward Leonce Dodoz who tormented the Bagan’s defence was awarded the Hero of the Match. Aizawl’s head coach Paulo Menezes made two changes in the playing XI as David Rinmuana and Lalhriatrenga were slotted in place of injured Kareem Omolaja and Lalthathanga Khawlhring. The Mariners made a sole change in their playing XI, while Rana Gharami replaced Kingshuk Debnath. Before the clock struck even a minute, Aizawl’s Japanese striker Yugo Kobayashi was booked for his challenge on former Aizawl defender Kingsley. The return of David proved immense as the home side dominated the ball possession. But it was the visitors who registered the first shot of the match after Lebanese striker Moghrabi was brought down on the edge the box. Watson stepped up to take free-kick but his effort went straight into Aizawl’s goalkeeper Avilash Paul. The hosts had a superb chance to go up but Albert couldn’t steer his shot towards the target. After playing out a plethora of passes, Albert skipped past Kingsley but eventually, his shot from inside the box flew away from goal. David then tried his luck from 25 yards but the midfield maestro couldn’t engineer his shot towards the target. Dodoz stole the ball in the Mohun Bagan half as he was intercepted by Kingsley and first 45 minutes ended without much goalmouth actions which the fans wanted to see from both the teams. The second half proved to be a much different scenario as both teams gunned for the maximum. The first chance fell to Romanian midfielder Andrei Ionescu but the midfielder could not pull the trigger as Bagan boys intercepted. Aizawl hit the pedal to the search for the decisive goal and in came Khawlrhing who scored the first goal of the match in the 73rd minute. Ivorian forward Dodoz tormented Bagan right-back Arijit Bagui before delivering a cross towards Mohun Bagan goal. Albeit Puitea’s first attempt was superbly palmed away by Shilton Paul but the ball ricocheted off the crossbar. Ricky threw himself but neither the defender nor the goalie could do anything from conceding the goal. 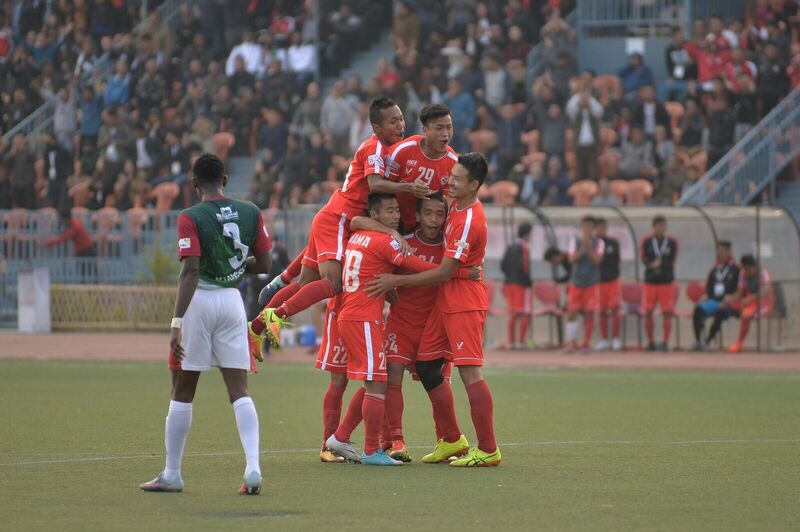 Aizawl fans’ celebrations were not yet over when the away team were awarded a penalty as Moghrabi was brought down in the box after a challenge from Avilash Paul inside the box. Manandeep Singh stepped up and made no mistake as he wrongfooted the goalkeeper to level the game in the 78 minute. A minute passed by and Andrei found himself on the edge of the box but his curling effort kissed the woodwork before going out of bounce. The game tempo boiled towards the end of the game and Moghrabi was at the centre of attention again. Aizawl captain Alfred Jaryan fouled the striker and was given a marching order by the referee, much to the dismay of the player and the home fans. Both sides tried tooth and nail for the three points but referee Senthil Nathan blew the final whistle as both the teams shared the spoils after 90 minutes of pulsating football.